How does the 2006 ELS Ranking compare to 2005 ELS Ranking (which looked at 2003-2004 faculty)? The methodology and data have changed. The empirical research output measure is based on a search of Westlaw rather than a selected set of journals and covers more years. The 2006 ELS Ranking is based on faculty as of August 1, 2006 whereas the 2005 Ranking was based on the 2003-2004 faculty. And the 2006 ranking includes all US News tier-1 schools. The 2006 Ranking is highly correlated with the 2005 Ranking (.82), but there is substantial movement. Noteworthy moves up the ranking: Vanderbilt up 15 spots, BYU up 11 spots, and Duke and Wake Forest each up 9 spots. Substantial losses: Iowa falls 23 spots, Fordham falls 20 spots, and Georgia falls 16 spots. Nine additional schools are in the 2006 Ranking. Of those, Ohio State at 22nd and Florida at 23rd make the strongest showing. How can I account for the dramatic rise of my home institution? Well, all three schools in this study that have employed me did very well: Northwestern (2001-2004), George Mason (visitor in 2000) and Vanderbilt (2004 to present). The only reasonable inference to draw is that my presence reflects and/or encourages ELS. Or, perhaps, I’m just very clever at constructing a measure that recognizes those places with which I’ve been affiliated. Either way, it’s all about me! But, in truth, Vanderbilt’s rise owes more to the Viscusi Effect. Kip Viscusi, who was recently hired away from Harvard Law, alone published as many or more articles citing statistical significance than 17 schools (some with as many as 65 professors). If Kip and his wife Joni Hirsch had not moved to Vanderbilt, then Vanderbilt would have been ranked 10th rather than 3rd. I welcome your feedback, either as posted comments or emails to me (tracey.george@vanderbilt.edu). Thanks to Jason and the other ELS Blog organizers. Guestblogging has been fun. The ELS ranking evaluates the intellectual environment and output of an institution by focusing on education, institutional roles, and publications of faculty. Yesterday, I posted the results for my proxy for education: professors with social science doctorates. Today, I present my findings on institutional role: professors with secondary appointments. Law professors with social science secondary appointments would seem more likely to be engaged in ELS research. Likewise, a law school with close ties to social science departments is more likely to support social science research. Such joint appointments are a signal of interdisciplinary spirit at the school as well as increased prospects for cross-fertilization. Of course, an appointment does not equate to activity in another department, nor does it require engagement in empirical scholarship. But, as a proxy, this measure tells us something about a school. Law professors are unlikely to hold secondary appointments in social science, as apparent from the list below of the top 10. Of the remaining 40 schools, 15 have positive percentages below 5% and the remaining 25 have no secondary appointments in social science. This proxy is the weakest of the three, in my estimation. How else can we measure a law school’s connections with social science departments? Law schools that extend secondary or courtesy appointments to social science professors also are more likely to be receptive to interdisciplinary work that includes empirical research and quantitative methods. It is a far weaker one than primary appointments because it doesn't reflect the same commitment of resources. Plus, as a practical matter, consistent identification is quite difficult. Other ideas? 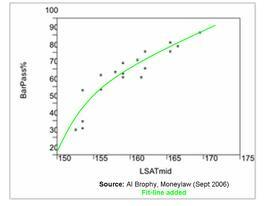 A visual inspection of Al's chart (here, bar passage and the calculated LSAT mid-point) suggests a curvalinear relationship. 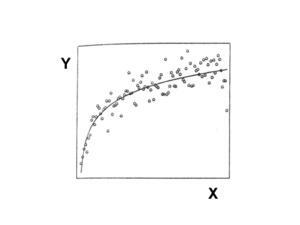 (Note that a correlation coefficient reflects the best-fitting straight line.) Since I don't have access to Al's data, I superimposed a rough fit line, which approximates the first graph. In April 2005, I participated in the Indiana Law Journal Symposium on “The Next Generation of Law School Rankings” organized by Paul Caron and Rafael Gely of Cincinnati and ELS blog’s own Bill Henderson and Jeff Stake of Indiana. Invited to discuss ranking methodologies, I opted to create my own ranking. For me, the choice of focus was obvious: Empirical Legal Scholarship (ELS). Why? An ELS Ranking identifies schools leading in this burgeoning field and perhaps incentivizes others to invest in it. The paper ranked each of the top 41 schools in US News based on an ELS-score that I constructed. The score included three variables: professors with social science doctorates, professors holding secondary appointments in social science departments, and articles in ELS-oriented publications. First posted on SSRN on August 9, 2005, the paper has been viewed more than 4,000 times and downloaded more than 860 times. (By contrast, my paper with Jeff Berger on judicial entrepreneurs posted at the same time has been downloaded only a fraction of that number – help here!) UC-Berkeley and George Mason each boasted on its webpage that it tied for first. Legal Affairs and various law blogs all provided short discussions of the piece. Obviously, law professors and their groupies love law school rankings. I have revised, updated, and expanded the ranking and will post the new results over each of the next four days. The ranking now includes the top-50 schools in US News and looks at faculty as of 2006-2007 (as opposed to 2003-2004 in the original). This week, I will describe each measure and the new results, focusing on educational background and training on Tuesday, secondary appointments on Wednesday, and empirical research output (the only measure that has been completely changed) on Thursday. And, the 2006 ELS Ranking will be available on Friday. My purpose here is not simply to navel gaze but also to seek input on the measures. Operationalization is hard. And the power of any empirical results necessarily turns on the soundness of those measures. I invite comments on the value of rankings (particularly given the substantial research costs including time away from other work) as well as thoughts on the components of the ELS ranking. Thanks to Jason Czarnezki for inviting me to be a guest blogger and to Geoff Turvey for exceptional research assistance. This week's guest blogger is Tracey George, Professor of Law at Vanderbilt University Law School. Tracey studies judicial behavior, judicial politics and judicial selection. She previously served as professor of law at Northwestern University Law School , where she was also Faculty Associate at the Institute for Policy Research. After graduating from Stanford Law School, Professor George clerked for Judge Francis D. Murnaghan, Jr., on the U.S. Court of Appeals for the Fourth Circuit and practiced law in Washington, D.C.. From 1996 through 2001, she served as an Associate Professor of Law and Adjunct Professor of Political Science at the University of Missouri School of Law. Some critics of “Systemic Analysis” have suggested that even if the mismatch effect exists, it doesn’t affect elite schools. Exhibit A is Richard Lempert’s claim that 97% of black Michigan graduates pass the bar. Exhibit B is Rothstein & Yoon’s contention that while there is evidence of mismatch among the lowest four quintiles of black students (measured by incoming credentials), the differences vanish at the top quintile. I think both claims are flawed; in this entry I’ll walk through Lempert’s claim carefully. Let’s start by looking at the Bar Passage Study (BPS) data to get an idea what outcomes are like for students at a Michigan-caliber law school. We don't know whether Michigan actually participated in the BPS study. What the BPS calls Cluster 5 (and I will call Tier 1) is the most elite, but it generally includes smaller, private schools. Cluster 4 (aka Tier 2) is generally less elite and includes larger, public schools. A school like Michigan -- large, public, but very elite -- could plausibly fit into either tier. Because the two tiers together represent roughly the top 30 law schools, it's reasonable to use them together as a benchmark. The outcomes for blacks at the elite schools are certainly better than for blacks at lower tier schools, but still very troubling. For all blacks in the BPS, the first-time bar passage rate for blacks is 61%, against 91% for whites. The 70.2% figure for blacks at elite schools is far closer to the overall black number than the white number. At the Illinois College of Law, Tom Ulen, Jennifer Robbennolt, and Bob Lawless are co-teaching a new course on empirical methods for lawyers. On the Law & Economics Blog, Tom has posted the course syllabus, which impressed me as very comprehensive. They are looking for feedback from ELS types, so I encourage readers to check it out. I know that John Donahue at Yale, Rick Sander at UCLA, and Michael Heise at Cornell (and formerly while at Case) have all taught law school quantitative and/or empirical methods course that were very popular with students. Obviously, this is a trend. To build more momentum, I hope Tom (at L&E) and Bob (at Credit Slips) will post a summary of the semester.